Recently I was told by a trader that opening gaps in the currency markets close 61% of the time. My Traders Mind immediately went into “?” mode for reasons that will soon become clear. The only way I know to resolve issues like this is to test them so as soon as I had a couple of hours to spare, that is what I did. I have no idea where this questionable piece of information originally came from but statements like this are not uncommon in the trading and investment world and therein lies a problem. Many people hearing this sort of thing believe it, act on it and even offer it to others as sound advice. One of the problems with the previously mentioned statement about opening gaps was that it didn’t provide any information about the conditions under which it was claimed to be valid. It was simply too general and thereby essentially meaningless. I will therefore start by defining some terms of reference, beginning with what we mean by an opening gap. 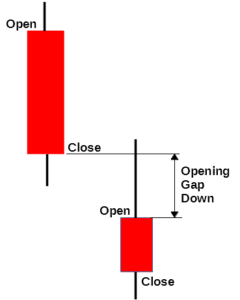 An opening gap is simply when a price bar opens above or below the closing price of the previous bar. In other words the price makes a sudden jump. Fig 1. Gap opening down. This gap was closed by the by high price during the day. Fig 2. Gap opening up. This gap didn’t close during the day. 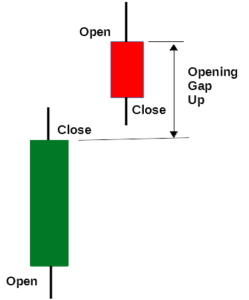 Gaps can occur at any time; but in the currency markets, which except for weekends are active 24 hours a day, most gaps occur when the market re-opens after the weekend. According to my tests more than 80% of gaps occur at these times. The next thing we need to consider is how big a gap needs to be in order to be worthwhile for trading. If we consider every small gap, they are going to occur very frequently, but common sense tells us that most of them will be closed, at least temporarily, by random market movement shortly after they open. This is not of much practical interest if we are looking to define a trade-able edge. On the other hand we would expect large opening gaps that might provide good trading opportunities to occur much less frequently. AUDCAD , AUDCHF, AUDJPY, AUDNZD, AUDUSD, CADJPY, CHFJPY, EURAUD, EURCAD, EURCHF, EURGBP, EURJPY, EURNZD, EURUSD, GBPAUD, GBPCAD, GBPCHF, GBPJPY, GBPNZD, GBPUSD, NZDJPY, NZDUSD, USDCAD, USDCHF, USDJPY. Fig 3 – Number of trade opportunities (expectancy) as a function of opening gap size. The chart of fig 3 is based on my tests and shows pretty much what was expected. We get a very large number of small opening gaps which decrease exponentially as the size of the gap increases. This effects the number of potential trade opportunities which is often referred to as expectancy. Keep in mind when estimating expectancy that these numbers are based on 10 years of data and that a significant number of these gaps are likely to occur simultaneously across a number of currency pairs due to the correlation that often exists between them. Fig 4 – Number of gaps as a function of the size of the opening gap. The results of my next test, shown in fig 4, may at first appear counter intuitive. It shows that as the opening gap gets bigger the probability of it closing is reduced. Of course this doesn’t mean that the gap doesn’t retrace to some extent. It just means that if you had an exit stop set at the opening price you would not have taken a profit on that day. The approximate break-even point is shown by the red vertical line on the fig 4 chart. 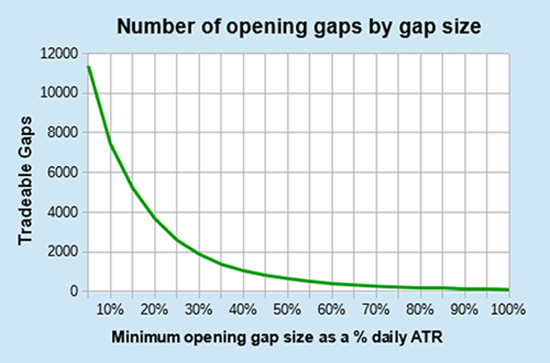 It suggests that any opening gap greater than about 35% of the daily ATR has less than a 50% chance (a coin toss) of closing the gap that day. It appears that we have a fairly narrow range for trade-able gap openings. 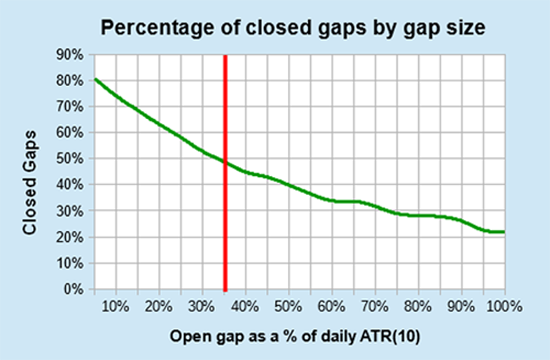 If the gap is much less than 20% of the daily ATR it may be too small to be worth trading. On the other hand an opening gap of more than about 35% offers no statistical advantage or edge. My next step was to test some individual currency pairs with opening gaps between 20% and 35%. Over the 10 year test period there were a total of 2305 opening gap trading opportunities for the 25 tested currency pairs. 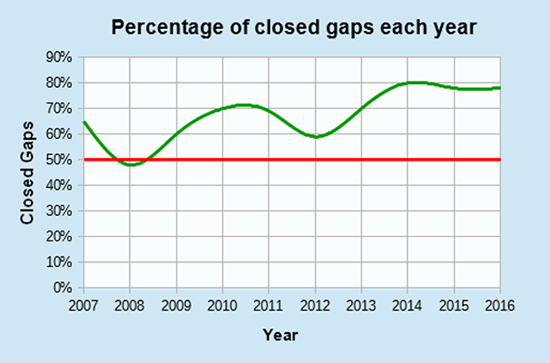 The percentage of gaps that closed for all pairs was on average 72%. For brevity, I am just showing five of these pairs which includes the best and worst performers. The results in the fig 5 table show significant variation between the different currencies. Trading NZDJPY with only a 56% probability of closing would have been a barely viable proposition while trades on USDCHF with an 84% probability of closing had the potential to be very profitable. The final test was to look at the performance of the above 5 currency pairs for each year over the 10 year period. As the results show, the year to year performance is not consistent. 2008 would have been a losing year using a strategy based on this method with these 5 pairs. 2014 onward however would have been quite profitable. We could go on slicing and dicing the data to learn more about the characteristics of currency pair gaps and whether or not they provide a viable edge and opportunity for a profitable strategy. Two things, however, have been clearly illustrated. There are significant variations over time. There are significant variations between different currency pairs. These variable characteristics are typical. They are not just limited to opening gaps or currencies. They apply to all financial markets over all time frames. To use technical analysis effectively they must be taken into account but this can provide some significant challenges as well as requiring quite a bit of effort. Without understanding and allowing for the dynamic nature of markets, attempting to use TA for short term trading or longer term investing typically becomes an exercise in disappointment and frustration. Prettү! This has been a really wonderful article. Thanks for supρlying these details.